In 1972, the 2500M sports car was introduced, and rapidly became the best seller of the new M-Series. 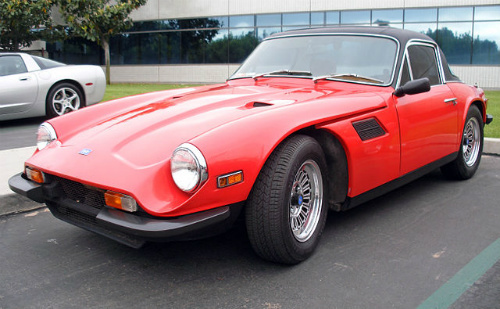 However, there was a certain confusion caused by the fact that there was a pre M-Series 1971 variant, called the Vixen 2500 in the UK, which was targeted at the US market, where it was designated the TVR 2500. This latter variant consisted of the previous Tuscan V6, powered by a TR6 engine that had already cleared US emission control regulations. Within a year, 289 units of the TVR 2500 were built, together with 96 units which incorporated the M-Series chassis fitted to the old style body. The M-Series chassis was designed to accommodate a variety of engine sizes, although the 6-cylinder, 2.5 litre unit from the Triumph TR6 was the choice for the majority of M-Series production. Body panels from other M-Series cars were available to the 2500M. An important styling change involved the nose section of the car being lengthened by 9 inches, which gave it a sportier, and more up-to-date image. However, the true purpose behind this change was that the additional emission control equipment required for certification left the engine susceptible to overheating. Consequently, the benefit of the extended nose was that it increased airflow to the cooling system. Furthermore, by carefully adjusting the contour of the doors, and extending and raising the tail section, this provided a smoother and more flowing profile. Even though the M-Series used the Vixen's 90 inch wheelbase and fastback styling, it was now more elegant as a result of its longer front and extended rear. Early versions displayed shortened chrome bumpers, the Vixen's black alloy wheels, and rear lights sourced from the Ford Cortina saloon. However, these were later superseded by shortened rubber versions, and rear lights from the TR6. Apart from the engine, other components sourced from Triumph included the gearbox, differential, and part of the front suspension. The 2500M sports car was available in the UK until 1973, at which point the 3000M variant became available, and offered much better performance. An additional problem for the 2500M was that, in September 1974, Triumph introduced the TR7 sports car, powered by a 2 litre engine. Consequently, with a shift away from using the 2.5 litre power unit, as fitted to the TR6, this engine was discontinued. This meant that production of the 2500M had to end in 1977, since existing stocks of this engine at Triumph were now exhausted. With a compression ratio of 8.5:1, the 2.5 litre engine was fitted with two Stromberg carburettors, and developed 106 bhp at 4900 rpm, and 133 ft/lbs of torque at 3000 rpm. This produced a top speed of 109 mph, and a 0-60 mph time of 9.3 secs. It was fitted with a four speed gearbox, with overdrive being offered as an optional extra. With disc brakes at the front and drums at the rear, it returned a very healthy fuel consumption of 30 mpg. It was a two seater, and there was still no external boot for storage. The 2500M variant exported to the US was also made available in the UK, but fitted with the more powerful fuel injected TR6 engine. Between 1972 and 1977, when the 2500M was phased out, a total of 947 units were sold, making it the best selling TVR up to that time, and helped to increase the profile of the company. US exports of the 2500M sports car accounted for 80% of production, and continued until 1977 when the supply of TR6 engines ended.